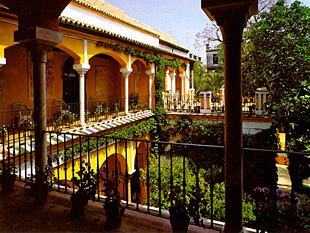 Located in the historic part of Seville, on the decumanus maximus of the Roman town, at the border of the medieval Jewish quarter and just a ten-minute walk from the Alcázar-Cathedral complex, the Casa de Pilatos, the largest and most sumptuous private residence in the city, is a privileged location--the only one of its kind in Seville--for holding small and large-scale private events. After it closes to the public, private tours guided by an art historian can also be arranged for small groups. For further details about the palace as a whole, we recommend visiting the section Discover the palace through visual notes. 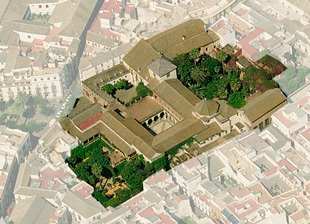 Dimensiones 18 x 15 m.
A large courtyard typical of Andalusian architecture leading to the stables and main courtyard by means of galleries along two of its sides, which provide shelter from the rain and sun. 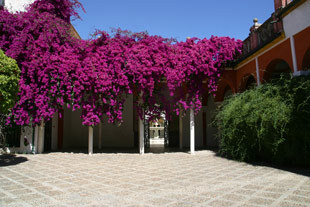 The arches are covered in century-old bougainvillea and overlooking the galleries is a medieval bust of King Peter the Cruel. 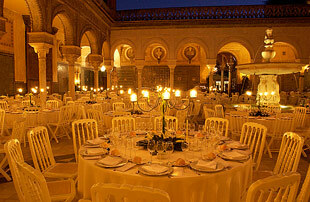 Dimensiones 18 x 18 m.
This spacious courtyard sums up extraordinarily well the history of the construction of this palatial residence, as it combines Gothic, Hispano-Moresque and Renaissance features. 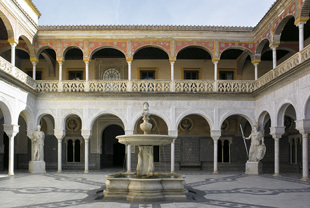 The irregular layout of the arches and the use of tiled panels and plasterwork are legacies of Hispano-Moresque architecture; the balustrade of the upper gallery is Gothic tracery; and the dimensions of the courtyard, the marble columns, the Genoese carved fountain and the collection of restored emperors' busts sent from Italy in the second half of the 16th century are purely Renaissance elements. 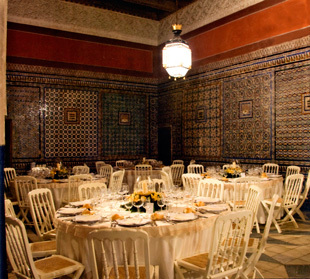 Dimensiones 22 x 6 m.
This grand salon preserves all the original elements dating from its construction around 1530, even the Mudejar inlay work of which traces of the former polychromy can still be distinguished. 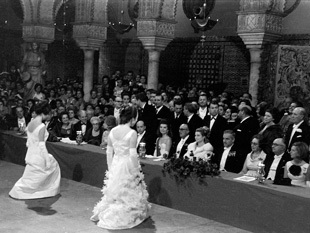 It is the work of the same craftsman who executed the handsome coffered ceiling in the centre of which Fadrique Enríquez de Ribera placed the coats of arms of his family from his parents to his great-grandparents. 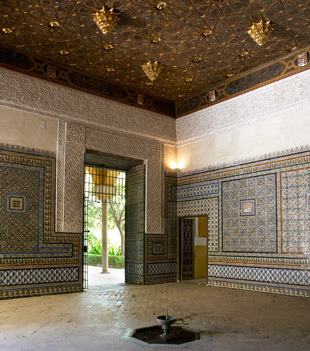 As it is a drawing-room of the "summer quarters", its walls are faced with cuenca or arista tiles imitating the patterns of the tapestries that would have adorned the equivalent rooms of the "winter quarters" on the upper floor. 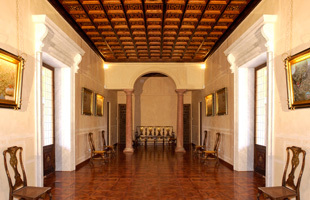 Dimensiones 18 x 6 m.
This salon is the largest room in the mansion built by Pedro Enríquez and Catalina de Ribera at the end of the 15th century. 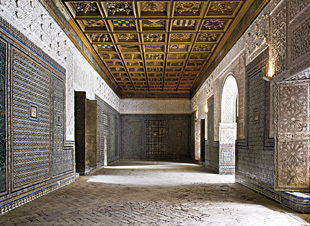 Also known as the Judges' Resting Room, it serves as an ante-chapel and its walls, as in almost the entire ground floor, are faced with the outstanding collection of tiles that the couple's son, the 1st Marquis of Tarifa, commissioned from the workshop of the Polido brothers, potters of Triana, between 1536 and 1538. 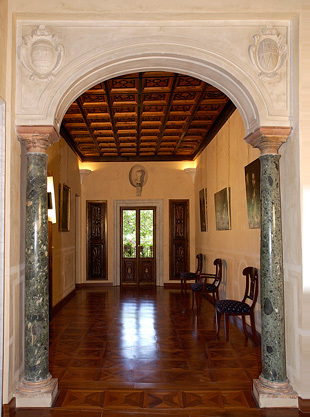 A prominent feature in the centre of the salon is the chapel entrance, crafted in fine plasterwork with Isabelline gothic motifs, which still preserves its original, beautifully polychromed 15th-century doors displaying the aforementioned spouses' armorial emblem that combines the coats of arms of the Enríquez and Sotomayor families. 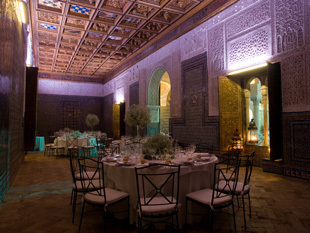 Dimensiones 8 x 8 m.
This room has inherited some of the characteristics of ceremonial halls, the aula regia or qubba of Spanish-Muslim architecture, as it opens onto both the main courtyard and the former orchard and has a coffered ceiling of ten-point stars inspired by dome motifs symbolising the celestial vault. Dimensiones 16 x 4 m.
Dimensiones 25 x 9 m.
This area was originally the cabinet of curiosities of the 1st Marquis of Tarifa and was converted into an antiquarium by his nephew, the 1st Duke of Alcalá, who replaced the original ceiling of gilt caissons with the current one of groin vaults resting on pairs of columns. 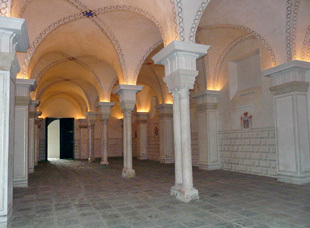 It was used as stables in the 19th century. 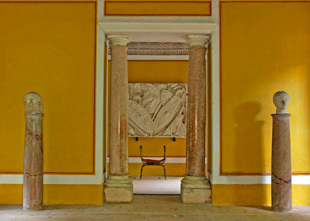 Dimensiones 9,30 x 4,34 m.
Named as a tribute to the current Duchess of Medinaceli, this salon, which is ideally suited to working sessions and corporate meetings, is located between two loggias, that of the small garden and that of the Ecce Homo from which the dukes once watched the Passion plays, juegos de cañas (mock tournaments with reed darts) and bullfights staged in the then private Plaza de Pilatos. 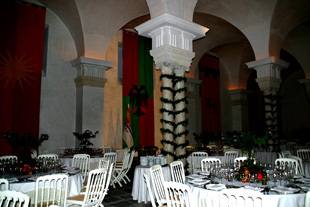 The whole area is air-conditioned and is equipped with a public address system and wired and wireless network and can be used for daytime events held during opening hours. 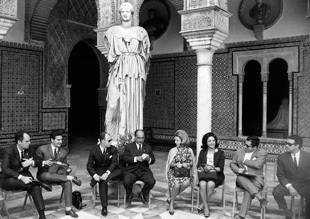 Dimensiones 6,60 x 4,35 m. y 6,00 x 3,05 m.
This area, which is ideally suited to working sessions and corporate meetings, is named after the 3rd Duke of Alcalá on account of the armorial device that adorns its coffered ceiling, which combines the arms of Enríquez de Ribera (House of Alcalá) and those of the Girones (House of Osuna), corresponding respectively to the father and mother of this viceroy of Naples called Fernando Enríquez de Ribera. This whole area is air-conditioned and equipped with a public address system and wired and wireless networks and can be used for daytime events held during opening hours. Dimensiones 7,25 x 6,45 m.
A loggia adjoining the Praetor's Room, built in 1530 like the latter and opening onto the small garden, leads to the Golden Room, a pavilion with a richly gilded coffered ceiling of caissons, adorned with honeycomb work and enclosed by an impressive plateresque railing. 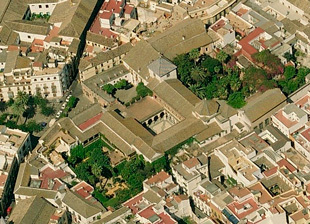 This entire area houses prominent pieces from the collection formed in Italy by the 1st Duke of Alcalá, such as the bas-reliefs from the middle of the 1st century AD commemorating Augustus's victory over Mark Antony and Cleopatra at the battle of Actium in 31 BC. 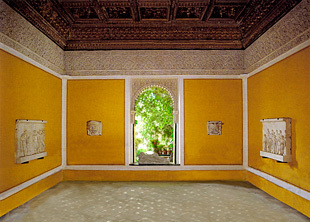 Loggia that overlooks the oldest part of the small garden, adjacent to the Fresco Room, that of the Duchess and the drawing room of the 3rd Duke of Alcalá. 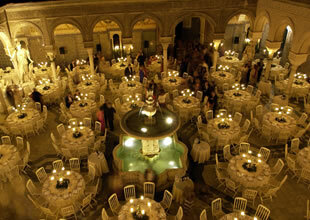 This area can also be used for daytime events held during opening hours.